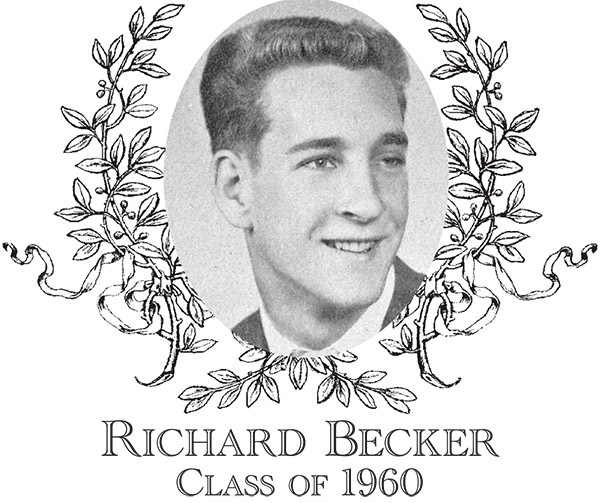 Richard "Vin" Becker, Class of 1960, was a three-sport athlete, playing basketball, football, and baseball. Vin's impact in the Bartlett sports program began his sophomore year, however it was in his senior year that he became a standout athlete. That year, Vin's teams compiled a combined 39-8 record. Fellow Hall of Famer Ed Kunkel stated Vin "was the foundation of each of those teams and one of the main reasons for their success." In football, Vin was the starting tight end his senior year. Hall of Fame Coach Don Ferrari stated "Vin was a leader on defense and one of the best blockers on the team." He was also a leading receiver, guiding the team to a 6-3 record. In basketball, Vin was Captain of a 17-2 team described by local scribe Don Peters as "the best basketball team BHS has had in over a decade." Vin was the leading rebounder and second in scoring, averaging 15 points per game his senior year. Vin was the starting catcher and inspirational leader of a 16-3 baseball team. Vin led his senior year team over Gardner in the regional finals, qualifying for the Western Massachusetts State Tournament. Perhaps the most amazing and impactful fact of Vin's senior year is that he was a starter in all 47 games played by the football, basketball, and baseball teams. Vin never missed a game or a practice. Vin's athletic prowess was recognized at graduation; he was awarded the Bartlett High School Athletic Medal, recognizing outstanding achievement, example, and influence in the Bartlett Athletic Program. Following graduation, Vin attended Nichols College and continued his athletic career as Co-Captain of the football team and Captain of the basketball team. He was inducted into the Nichols Hall of Fame in 1988 for his football achievements. Vin graduated with a Bachelor of Business Administration leading to many years as a successful owner of Bassett Furniture Stores and NEHDS Logistics. Vin also spent time coaching football and basketball for the Indians as well as football for Nichols College. He was an original founder of the Pop Warner Football program in Webster. Vin and his wife Deanna reside in Madison, CT. They have four children, Ross, Craig, Chris, and Kelly.